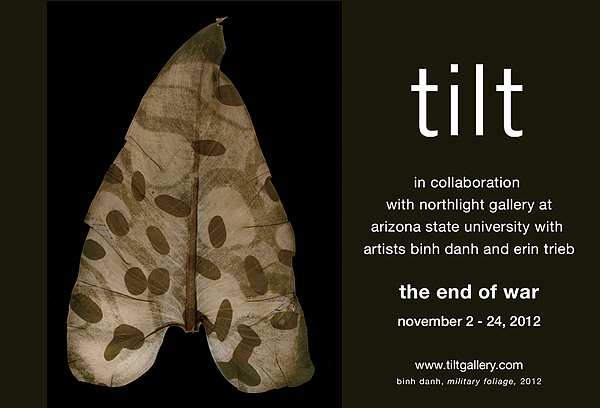 Tilt Gallery will feature works by artists Binh Danh and Erin Trieb. Northlight Gallery will host The End of War November 6 – December 1st. The Art Café in the ASU Memorial Union will host selections from The End of War November 6 – December 12, 2012. Northlight Gallery, Lynne Estomin will speak on Friday, November 16 at 6:30 p.m. about her video Out of Step, which features the voices of 4 female veterans from the wars in Iraq and Afghanistan. “The End of War” features the work of artists who endeavor to illuminate the complicated and challenging effects of war including the growing military-industrial complex, concepts of patriotism and heroism, the effects of continuous war on the cultural psyche, and the intimate struggle of our veterans with PTSD. It has been argued that war is part of human nature. Certainly it could be agreed that the violence that is a result of war is a destructive force and that the effects of this violence include death, physical injury, starvation, disease, pain, loss, and psychological trauma. Through the artists’ images The End of War promotes a dialog about war and the resultant effects, not an argument of whether or not war is an inevitable part of the human experience. Ultimately these images challenge the viewer to care more deeply, and be more active in the pursuit of peace. Modified Arts will feature “War Texts” Oct. 19 – Nov. 10, from 6 to 9pm.